We collected and analyzed email data from nearly 2.16 Million messages sent using SalesHandy to create this White Paper report. 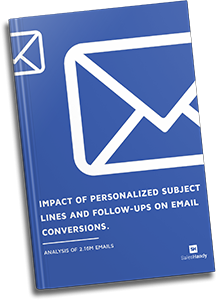 Learn how email subject line personalization and other factors affect email effectiveness. This guide also covers proven best practices and benchmarks for email follow-ups that will help you increase conversions from your emailing efforts. Factors that affect email effectiveness. Effect of using personalized subject line on email open and reply rate. Importance of follow-up emails and a study on its effect on email open and response rate. Study on the optimum number of follow-up stages required to get maximum results. Study on how long should one wait before sending another consecutive follow-up email stage.